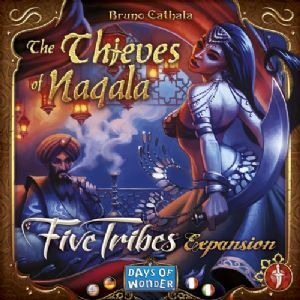 Five Tribes: The Thieves of Naqala is a mini-expansion of six thief cards and one new djinn for Five Tribes that introduces a new element the base game to create a real thorn in your opponents' side. The djinn is shuffled into the deck with the other djinns and protects you from the effects of thieves. 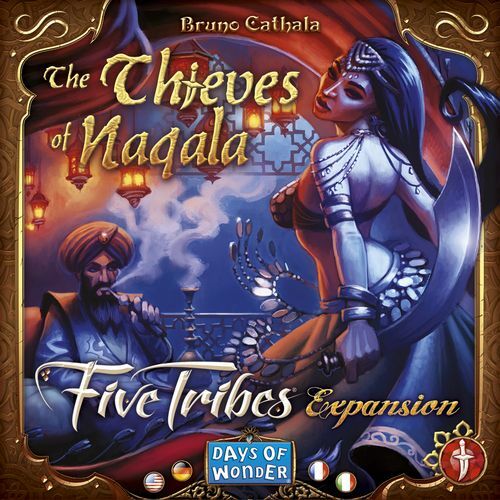 One thief card is revealed at random at the start of the game, and whenever someone would buy a djinn, they can purchase the thief card for the same price as the djinn. Each thief is associated with one of the tribes, and whenever you take an action with that tribe, you can choose to activate and discard the thief. If you do, everyone else must get rid of something — two resource cards, one tile they control, even a djinn or palace — after which you get to choose to keep something from all the discarded things.